The HTC DROID DNA comes in a relatively small, Verizon branded box. Inside, you will find a charger, a microUSB cable, as well as a small key for removing the microSIM card. The HTC DROID DNA looks a lot like its Japanese relative, the HTC J butterfly. The smartphone is a handsome bloke - it sports clean lines and cool red plus that huge bright screen on the front. The handset's designers have done well with the sides, too - the perforated metal strips are said to be inspired by supercars' design. The size of the smartphone is quite good given the massive screen on board. The HTC DROID DNA stands at 141 x 70.5 x 9.7 mm and while it won't win any slimness awards its footprint is barely any bigger than the Galaxy S III despite the despite packing a 0.2" display. The weight is also quite acceptable at 138 grams. 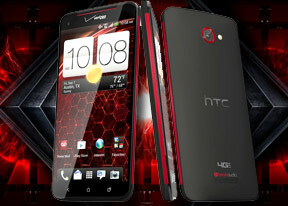 During the smartphone's announcement, HTC reps were adamant that the device is not going to be marketed as a phablet. The HTC DROID DNA's measures also prove this point - the handset stands much closer to the high end Android smartphones of late, than the Samsung Galaxy Note II. Build quality is superb. The DROID DNA is made of soft-feel plastic, while its entire front, including the trio of buttons, front facing camera, and sensors, is covered by Corning Gorilla Glass 2. There are no nasty gaps to worry about. The 5" Super LCD3 display with full HD resolution is a marvel to look at and the first of its kind to be featured in a smartphone in the United States. With a pixel density of 441ppi, the DROID's screen handily beats all competitors' offerings in terms of sharpness. It simply exceeds the boundaries of human perception - it is impossible to distinguish pixels no matter how good one's vision is. Contrast and sunlight legibility are pretty good too - the display is easy to operate even under direct sunlight. We guess the fact that it is one the brighter screens around helps a lot here. In order to give you an idea how sharp a screen with pixel density of 441ppi is, we put the HTC DROID DNA display under a macro lens and compared it with the 1280 x 768 pixel display of the LG Optimus G and the WVGA unit of the Nokia Lumia 810. As you can see above, 5" 1080p display of the latest HTC offering represents a noticeable improvement over what we've seen in the past. The sweetest part of all is that full HD resolution is about to become the standard for top shelf Android smartphones next year. Above the display, you will find the earpiece, the front-facing camera, as well as the usual set of sensors. The typical for HTC droids trio of buttons can be found below the screen. There is nothing on the left side of the DROID. On the right, you will find the lonely volume rocker. The top of the device is quite busy. It is home of the power/lock button, microSIM card tray, 3.5mm audio jack, as well as a secondary microphone for active noise cancellation. The microUSB port and mouthpiece are located at the bottom. The microUSB port is protected by a small plastic cover. The 8MP camera is located at the top of the smartphone's back. It is flanked by an LED flash and a notification light. The loudspeaker grille and the usual set of Verizon and HTC logos are located at the bottom. With the 2020mAh battery of the device being non-removable, we were quite skeptical about it powering such a powerful hardware and massive screen throughout an entire day. The HTC DROID DNA however, did surprise us pleasantly with its performance in our dedicated battery test. 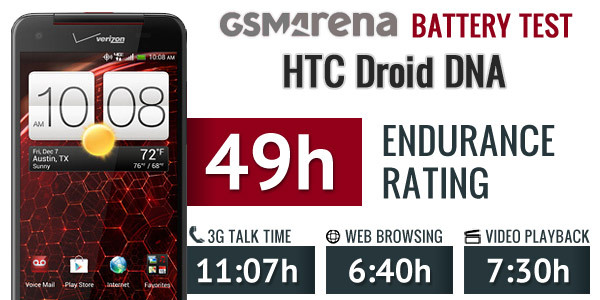 The smartphone managed an endurance rating of 49h, which is more than most of its direct rivals got. The above rating means that you will need to recharge your smartphone every 49 hours if you use it for an hour each of telephony, web browsing, and video playback daily. We must point out once again that the browser part of the battery test has been conducted over a Wi-Fi network. Should you rely solely on Verizon's LTE infrastructure, you can reasonably expect a dip in your device's longevity - the battery went flat after only about 4 hours of LTE browsing. By the way, HTC enabled wireless charging on the DROID DNA with the Qi protocol, but you'll need to purchase a compatible charger for that to work. Handling the HTC DROID DNA was another pleasant surprise to us. The handset was a breeze to operate thanks to being almost as narrow as the HTC One X. The soft-feel plastic also felt assuring and grippy. Overall, we give high marks to the HTC DROID DNA for its design and build quality. Display is superb, and battery life is great as long as you have a good Wi-Fi network at your disposal at all times. Following next is a look at the DROID's software, as well as a closer examination of its benchmark performance.